8. So What’s Trebek Like? 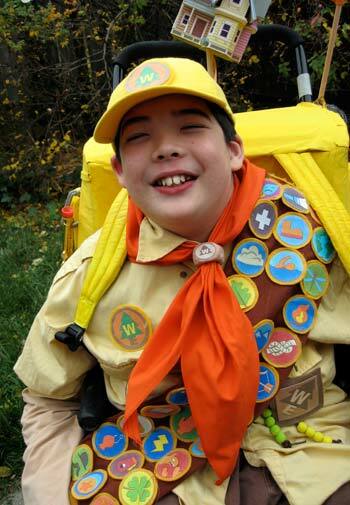 Jon as Russell, Up‘s Wilderness Explorer. As with every year (here’s 2004, 2005, 2006, 2007 and 2008), Jon chose his costume idea, and we got to work. I admit that expectation was a little high from those outside the household, and in the end, I personally bit off a little more than I could chew entirely. 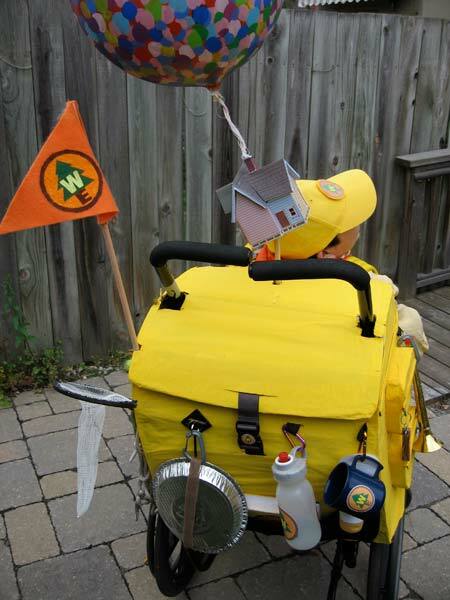 Laura took on the Wilderness Explorer costume, while I took on Russell’s massive backpack, and why not, the balloons and house model. 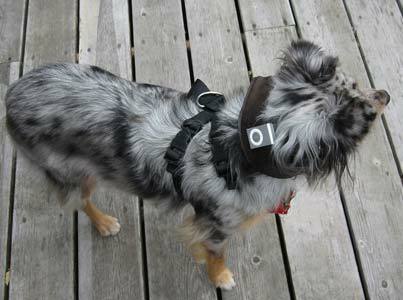 And Photon’s “costume” as well. Packed though it is, in the end, the backpack could never match Russell’s in the movie for the amount of stuff he had. Pretty much everything that Russell wears in the movie features the fictional Wilderness Explorer brand. I had elaborate plans to use bubblewrap to cover a mylar balloon, thus making it look somewhat more like the tens of thousands that Carl Fredrickson used in the movie. Sadly, experiments showed that this is impossible. 1) Just enough bubblewrap to cover the balloon actually brings it down and 2) the bubbles in bubblewrap are not fully filled (to be cushy, of course), so if you do paste some selected clippings on, they look like shrivelled boils. My balloon has a skin condition. In the end, it was enough of a challenge to paint the @#$% balloon itself. 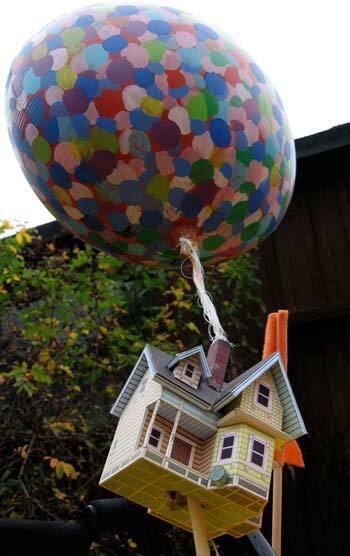 Detail of the house and balloons. The house model is a complex one I grabbed from at paper-replika.com, and I ended up have to leave out a few details due to time constraints. Very nice, all the same. Laura did a fantastic job on Russell’s uniform. Notice the missing “assisting the elderly badge” Also note the “Wild Animal Self-Defense” badge (north-east of clover leaf at bottom) amongst others. Yep, we got REAL geeky. Russell is reading from this at Carl’s doorstep at the beginning of the movie. Photon’s costume, as in other years, was started late and never quite worked, though it did electrically. It was a circuit board amp from an old pair of speakers hooked to a small speaker and an iPod shuffle to drive Dug’s voice from the movie. Sadly, I forgot that outside everyone uses an outdoor voice, especially at social events, which Halloween is on our street. So no one could hear Photon’s voice saying things like “Are you a dog, too?” and “Squirrel!”. Oh well, it did work! Can’t wait to check previous years’ costumes!!! you guys are absolutely amazing!!!!!!!!! So what’s this movie, Up, is it? OUTSTANDING!!! As always you guys rock when it comes to costume making! So glad Jon was feeling better and made it out Saturday night. As always thanks so much for sharing – I look forward to this posting every year. Holy cow, way cooler than i thought it could be. gonna take me some time to check out all the details. sweeeet! Amazing detail! I haven’t seen the movie but I have to see it now (I think it just came out on dvd? )–I need to see what this ‘Squirrel’ joke is all about! Just saw a commercial for the DVD “UP” last night. As if your costume was not cool enough – extra wow now!!! Must rent – want to understand “squirrel” better. Just saw Up. (not having young kids I’m a bit behind the times getting to see Disney movies.) Yes it was funny(loved the dogs and the squirrel joke) but it dealt with some pretty deep issues about love and death and alienation –before the balloon segment I kept wondering why this was rated a kids movie! 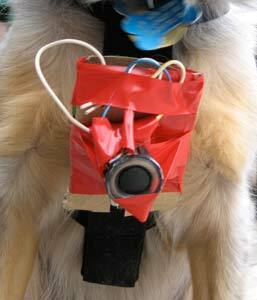 Anyways–If I was impressed before, I am now in AWE of your work on the costume! Great job P&L! And btw–Jonathon has an amazing resemblance to Russell even without the costume but Photon is a bit too colourful to be Dug. Tamiko: Pixar’s later stuff shouldn’t be called “kids’ movies”; they make true family movies, which puts them in the same category as Miyazaki and the new Doctor Who. Jon looks like Russell? Well, I hope he’s not quite as chunky! aww i love this!!! up is one of my favorite movies!! (yes, i’m 24…) very well done on the whole ensemble (as well as “dug”), and i really like the pixar trend. hopefully they’ll come out with another that works for you jon!! I was wondering are you guys going to send the pictures to Pixar by any chance? Great Job!! 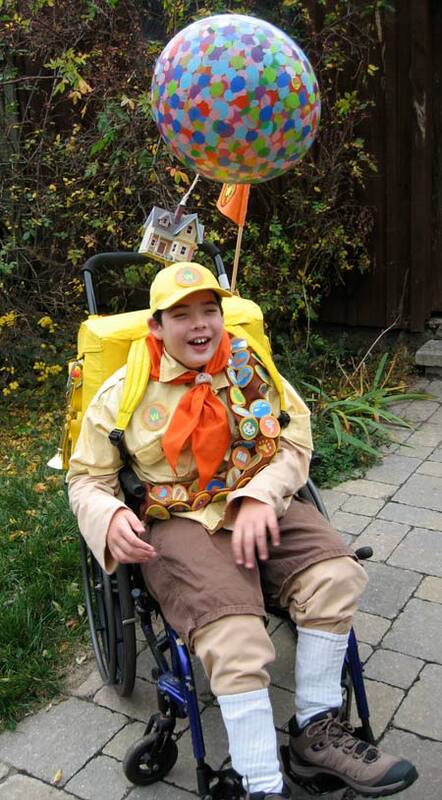 Wow that is a truly incredible halloween costume!! Inspired and fun. 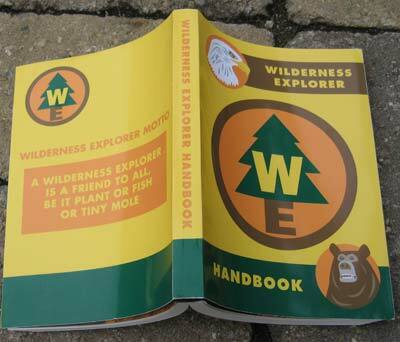 The Wilderness Explorer handbook – do you have a template or link you could share or sell? Very creative costume and excellent detail. I love it! @Em–No template: We got most of the designs by much googling of images, and then re-drawing it in Illustrator (graphic designers tend to go overboard on visual details). We do have “The Art of Up”, and we got a few badges from that, but I can’t remember if we sourced it for the handbook. We were actually very lucky and managed to download (legally; it was on an authorized site) a PDF file with some Up images, including most of the badges. Lo and behold, we were able to open the page in Illustrator and grab the vectors. Saved me lots of time!